Natural beauty abounds in Southeast Georgia as well as a strong business climate. Each county in the Southeast Georgia Region has very competitive millage rates. There are several industrial parks in the region that offer full utilities and a thriving business community. In addition, each County has quick access to a full range of medical services. You found the perfect location. Now find the perfect site. A diverse industrial base found in Southeast Georgia along with a strong business climate, offer new and expanding companies a proven place to do business. Industrial parks in the region offer full utilities, competitive tax rates, and easy access to safety services. Training programs, medical services and supportive economic development agencies provides the right partners for your growth needs. Quick access off I-95 or four lane divided highways found at all sites gives each site logistical advantages. With over 3600 acres zoned for industrial use, the region is able to provide sites for just about any project. 2840 acres have frontage along I-95 and are certified Georgia Ready for Accelerated Development (GRAD) by the State Department of Economic Development. This means there are no unknowns left for you to consider when choosing your site! Prices are very competitive when compared with nearby metro locations. AND, joining FTZ 144 offers relief from duty costs. Available acres with I-95 frontage and GRAD Certification. Lower per acre cost than nearby metro areas. Available acres with utilities and zoned for industrial use. Sites for all four modes of transportation: air, water, rail, highway. 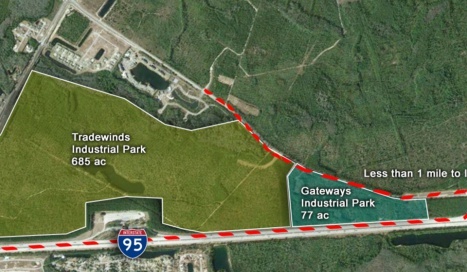 Tradewinds Industrial Park offers 687 acres with access to I-95 via a one mile drive over Hwy 99 to a completely undeveloped interchange, one of the few remaining on I 95. 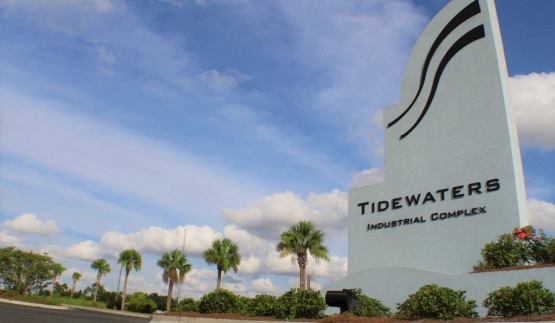 This industrial park is an opportunity to acquire a highly visible location (I-95) that is located perfectly in between the Port of Savannah and Jacksonville. A 355 Acre Industrial Site with GRAD Certification located 12 Miles from Brunswick Golden Isles Airport, 20 Miles from the Port of Brunswick and 1 Mile from Interstate 95. 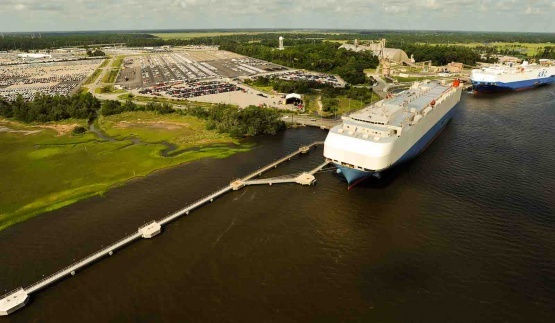 The Port of St. Marys Industrial and Logistics Center 425 developable acres with around 4,000 linear feet of waterfront for development into a dynamic, multi-use port, industrial and logistics center. Strategically located 8 miles from the open ocean and serviced by an active short-line railroad, 10 miles to major Class-1 railroad CSX. 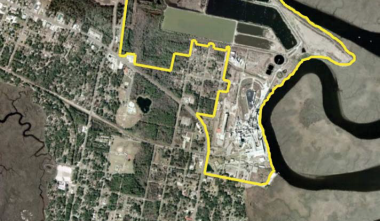 This 2,000 acre Industrial Site is located at the Brunswick Golden Isles (BQK) Airport and is available for development and will give direct access to the runway.